The MINI brand is once again combining the expansion of its model range with a foray into a new vehicle class. 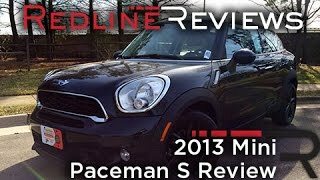 The MINI Paceman is the first Sports Activity Coupe in the premium small and compact segment. With its two doors and large tailgate, plus two full-size individual rear seats, the seventh model in the MINI family complements the elegant sportiness of its proportions with a new rendering of the familiar MINI interior. The MINI Paceman is available in four powerful and efficient petrol and diesel variants from launch, ranging from the MINI Cooper D Paceman (82 kW/112 hp) and MINI Cooper Paceman (90 kW/122 hp) to the MINI Cooper SD Paceman (105 kW/143 hp) and MINI Cooper S Paceman (135 kW/184 hp).